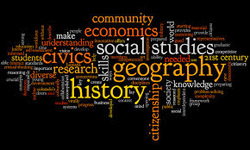 Students need a minimum of 6 credits in the area of Social Studies. Students have to take Geography, 2 of 3 Am. History, 2 electives, and Government. Classes offered at Carroll High School: World History 101, World History II, Am History 101, Am History II, Topics of History, Sociology, Economics, Government, National American Government, Psychology 111, Geography, Western Civilization.